What if some people are hampered by having to narrow their focus? How might certain folks maximize their capacities by living at the intersections of their associative thinkings? Emilie Wapnick gives a compelling talk about the nature of innovation and life as a “multipotentialite.” The three super powers of the multipotentialite may very well be the braid of new ideas strongly weaving a compelling life. Outcome of a project-based pursuit – a demo of deep learning. I’m fascinated by “Ge Wang: The DIY orchestra of the future.” It’s not so much the music he makes that fascinates me though. Watching this musician and computer scientist – but even more, watching this human being – I am struck by his curiosity, his experimentation, his integrated exploration and his interdisciplinarity. He’s got a project, and he’s exploring. And that’s a cool way of journeying to learn. Creativity as disobedient thought. HMW nurture curiosity over compliance? Creativity as “disobedient thought” — wonder sparked from our human drive to question. In his TEDxAuckland talk, “Disobedient Thinking,” Welby Ings examines a bit of the nature of typical schooling — systems biasing compliance over creativity. What is the record of time that school students are able to explore the questions that originate from within them, rather than from the initiation of an adult? How are we nurturing the nature of creativity which is disobedient thought? How are we nurturing citizens who believe questioning is actually at the heart and core of deep citizenship? 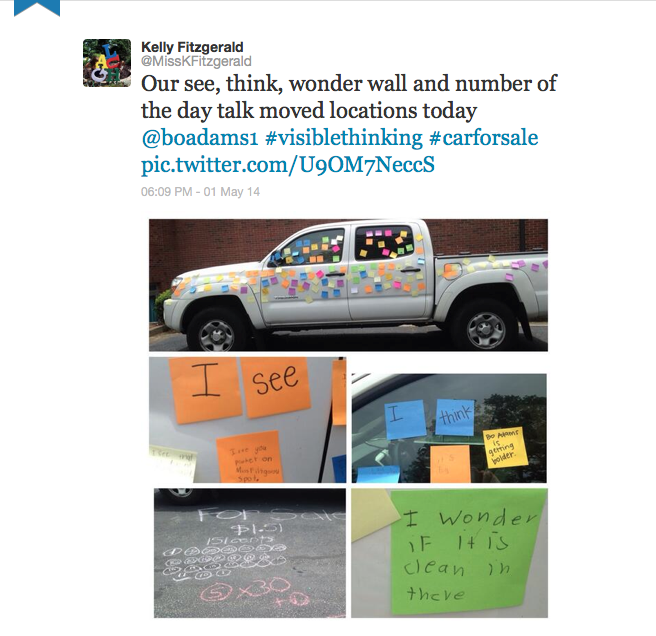 THANK YOU for my “See-Think-Wonder” Visible Thinking Routine that you created on my truck. I love it! To see the evidence of your thinking and learning is so fun and exciting.